This rut-ravaged old bull was holed up in the head of a canyon tributary where he didn’t have to move more than a few hundred yards to find everything he needed. The rut party may be over, but you can still find a date with a late-season bull. There is a period after the second estrus when elk country goes silent and still. Cows huddle in nursery herds and move to wintering areas. Bulls, thin and drained from rutting, move into thickets near water and easy forage and, in the words of one old-timer, lean on a tree to catch their breath. Winter winds are yet to rise, and bachelor groups of bulls are yet to form and begin wandering in search of feed. Sometimes brief, sometimes lasting a few weeks, it’s one of the hardest times of all to find and kill a bull. But sometimes hunters have no choice. It’s the open season specified on their tag. Or it’s the only time they can get off work. That doesn’t mean taking a bull is an impossible task. In fact, with a couple of tricks up your sleeve, you can turn the odds in your favor. If you had labored to impregnate a harem of 15 to 40 females over a six-week period while fending off testosterone-charged rivals and more or less fasting, you’d be tired and hungry, too. Wise bulls often vanish into out-of-the-way pockets stocked with nutrition-rich forage, water, and thick cover that shields them against predators and harsh weather. Ideally, they won’t move more than a couple hundred yards to access everything they need as they recover and pack on weight against the coming winter. Those old bulls are challenging to find. Usually, you’ve got to cover a lot of country. Wander up canyons to drainage heads and prowl through heavy, seep-dampened thickets in search of sign. It will be scant—perhaps a single track beside a seep. Move slowly, rifle ready for a quick shot at a bull rising like a wraith from the willows and staring at you bulge-eyed for a split-second before vanishing into the thicket serenaded by the sound of a small avalanche. Other prime spots for a big bull to hole up are along the base of cliff faces, where runoff water and deep fractures into nearby aquifers provide moisture that produces lush undergrowth. These spots provide a trifecta of dense cover, nutritious forage, and multiple escape routes. You will see some movement during the late season. Young bulls are prone to wander, searching for company and those penthouse pockets I’ve described. They often get shot for their pains because they’re more visible. There’s nothing wrong with shooting a younger bull, particularly during one of these challenging late-season hunts. The meat will be succulent, and most likely they’ll be in a more easily accessed area than will a wise old bull, thus making the pack from field to freezer simpler. If you want an old monarch, you’ll likely have to find him the hard way and dig him out of some wilderness hole. Get up high and glass, focusing on the fingers at the head of big canyons, on cliff bases and hanging valleys, and on tiny pockets of lush feed in secluded areas. While burning some boot leather is usually necessary, do that duty during the middle of the day. Prime time should find you sitting behind your binocular, probing for a solo bull’s bedroom and looking for the telltale buckskin glow of a feeding bull’s hide. Your eyes can cover a lot more country than your feet. Glass in a rhythmic pattern, returning frequently to prime pockets. Recovering solo bulls don’t move much, and you might just catch a momentary glimpse of one through a gap through the underbrush. 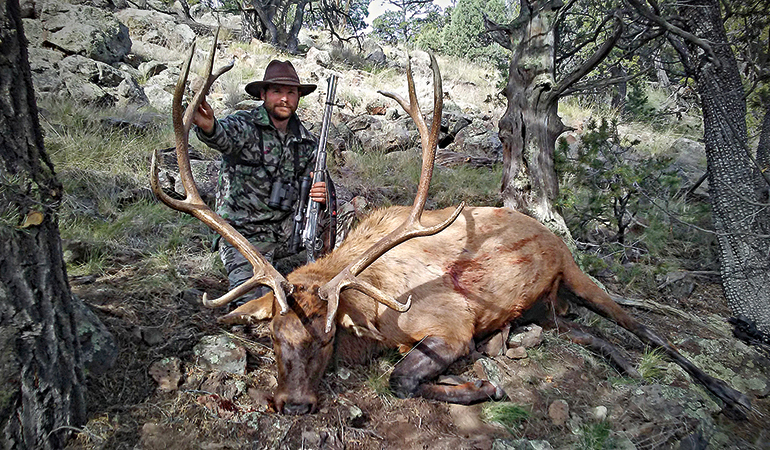 With no close approach possible, the author scaled a cross-canyon ridge and took this bull with a carefully placed 519-yard shot. I found just such a bull in New Mexico’s high desert mountain country. It was November, and while a few bulls still hung with fracturing harems, the oldest and wisest of them had headed for the tall timber to rest up. A long mile from my perch, a golden spot flashed briefly in a tiny hanging valley, glowing like a grain of brown rice against the drab green of a juniper thicket. When I turned the spotting scope on it, a massive beam swept out from behind the brush the bull was browsing on, its whale tale formation indicating its owner was a big six-by-six. A 50-foot move in any direction would put that bull inside impenetrably thick understory. There was no other opening in that entire drainage that I could shoot into, and it was likely the bull would move before I could get there. An adjacent ridgetop offered a tiny promontory to shoot from, and I had to try. 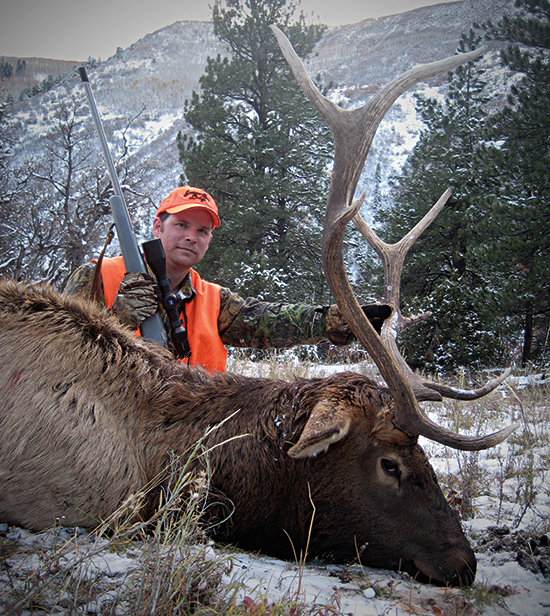 An hour’s worth of gut-wrenching, lung-burning effort later, I shot that big bull with my Remington 700 Ultimate Muzzleloader. He was standing not 10 yards from where I’d first seen him. If you locate a big solo bull, try and keep eyes on him and execute a stalk. Ideally, you’ll take him then and there, because lone, wise animals are just tough to see. Don’t despair if he vanishes. At the least, you have located a big bull, and you know where his bedroom is. Find a vantage point—preferably within range and downwind—and wait and watch. With luck, you’ll get your chance. Occasionally, the hunting gods bless you with fresh snow, particularly in the northern Rocky Mountain states. Give the elk a day to lay tracks, while you use that day to get ahead at work so you can take time off. Pull up your socks and rack up the miles, following ridgelines so you can glass across but focusing on travel routes such as saddles, finger ridges, and pinch points. Your goal is to find a fresh bull track, follow it, and shoot that bull in his bed. To do so you’ll have to be part hound, part cat, and part Sergeant York. The fresh snow should muffle your movement, but you’ll still have to move with extreme stealth. If you know what to look for, a bull’s tracks will tell you everything you need to know. An old bull will have a wide, blunt hoofprint and will sink deeply. Pay particular attention where he travels through heavy timber and gauge his antler width by the trees he passes—or won’t pass—between. A wide bull must often leave a game trail to skirt around trees stacked too close together. If the wind is wrong, it may already be too late. But savvy bulls like to feed into the wind before bedding, then face up their back trail when they lie down. That means he may not have smelled you, but he’s likely to see you first. Be prepared for a very brief shot opportunity. Glass carefully, picking apart every shadow. Move a step and repeat. Look for the flick of an ear or the glint of an antler tine. Your chances of getting a clean, ethical shot opportunity go way up if you see him first. When you take the hunt to his bedroom and kill an old bull during the post-rut stillness, you’ve accomplished something that few hunters achieve. But with the right set of tricks in your toolbox, it can be done.